Sunday was another glorious day. IÂ got the washing on the line (a skein of Shetland Tweed) and set to making my Portuguese Custard Tarts. 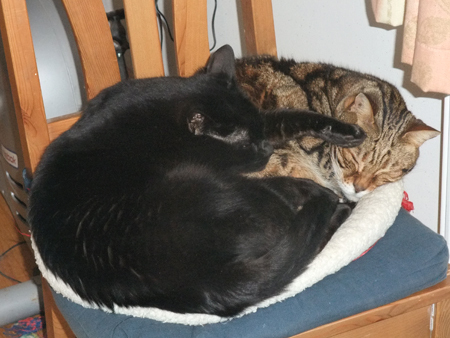 (I shall be writing these up properly over on the chooks’ blog some time soon.) 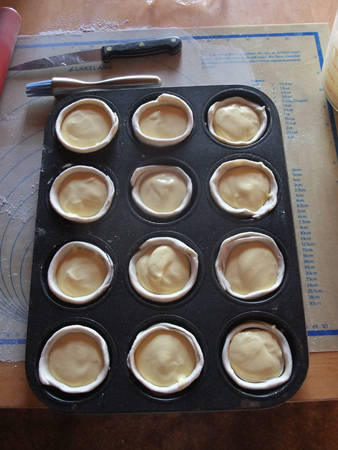 I had made the custard on Saturday, as it needs to be cold before baking the tarts. All I can say is that these things need work. First things first: find a different recipe. This one was clearly was not up to the job. 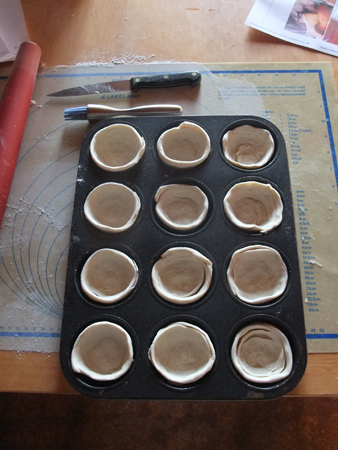 Forming the tart cases is clearly a skill that I lack. Having said this, the 10th, 11th and 12th case showed remarkable improvement over the 1st and 2nd examples. Fundamentally – the puff pastry is rolled out, then rolled up – like a swiss roll. The roll is cut into 12 slices and these are formed by hand into little cup cases. I imagine that originally there was no baking tray involved and these were raised by hand to stand alone. The first attempts were hopeless. Gradually I absorbed the idea that I should regard this material as clay, rather than as pastry. After that my bases improved. I also learned that the instruction “Then take each cut piece in hand and push down center of roll to meet center of opposite side” works best if equal upward force is applied. Pushing the centre up and down to meet in the middle gave me a much thinner and less stodgy base. I have to say that I have few quibbles with the custard part of this recipe, though next time I will make changes. The balance of flavours between the cinnamon, vanilla and lemon was very good. I found the custard oversweet… until I tasted the baked tarts. The recipe suggested baking at 148 deg C f or 15 minutes. I was very dubious – and rightly so. There is no way that temperature is adequate for puff pastry! Anyway, I followed instructions and ended up baking these babies for about an hour. They didn’t suffer too much, but I know that they could have been so much better. 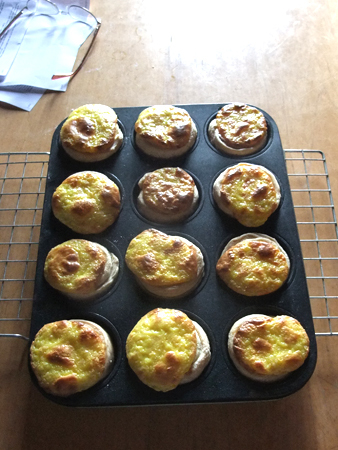 …we ate them hot, scoffing three each, for a very late breakfast. I want to work on these tarts and improve them. There are many recipes around and next time I plan to try the one at the BBC web site. Note the higher oven temperature and the longer cooking time. I’ll probably stick to the cinnamon/lemon/vanilla flavourings, though. One thing that I must do is to make thinner cases. Perhaps 18 from one packet of pastry, rather than 12. 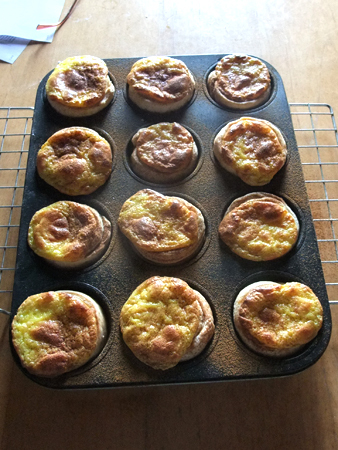 These definitely had an incorrect ratio of pastry to custard. The journey to the perfect Pasteis de Nata will continue elsewhere, though occasional comment will probably be made here. There’s too little time to go into detail right now but the UFO Reduction Plan is under threat from a requirement to make display and sale items, and to do some spinning of the yarn for that purpose. I shall need to review the timetable and be more realistic. More on that some other time.